Religion is one of the forms of spiritual oppression, lying everywhere on the masses of the people, who are oppressed by eternal work for others, need and isolation. The helplessness of the exploited classes in their struggle with the exploiters just as inevitably generates faith in a better life beyond the grave as the helplessness of the savage in his struggle with nature produces faith in gods, devils, miracles, etc. To him who works and is poor all his life religion teaches passivity and patience in earthly life, consoling him with the hope of a heavenly reward. To those who live on the labor of others religion teaches benevolence in earthly life, offering them a very cheap justification for all their exploiting existence and selling tickets to heavenly happiness at a reduced price. Religion is opium for the people. The ninety-ninth anniversary of the 1918 Bolshevik decree separating church and state was marked by a small group of ardent leftists protesting the current clericalization of the Russian state and Russian society. 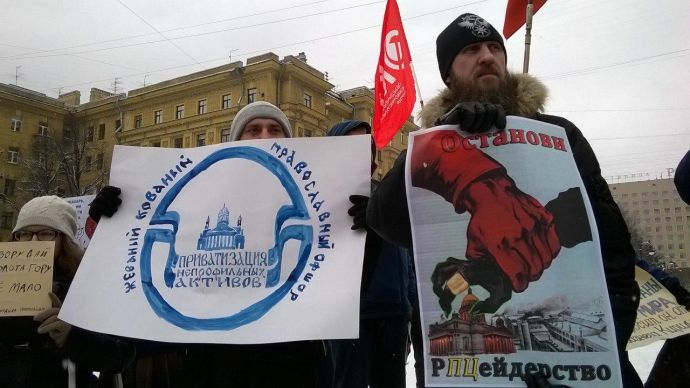 On February 5, over a hundred people attended a picket on Chernyshevsky Square in southern Petersburg. For two hours, they fiercely criticized both the Russian Orthodox Church (ROC) and the relationship that has been built between the ROC and the Putin regime. 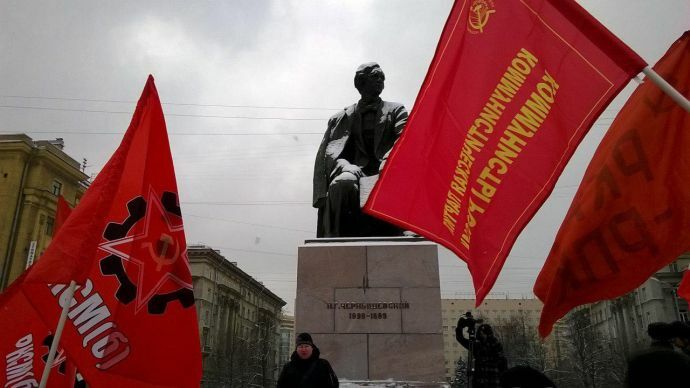 Members of various low-profile leftist movements gathered at the monument to Russian philosopher and revolutionary Nikolai Chernyshevsky. 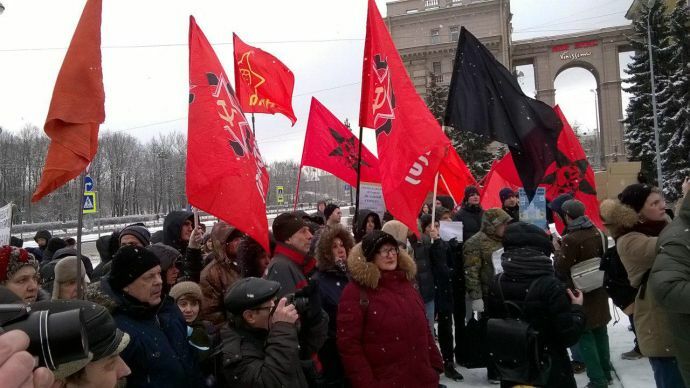 The protesters held the flags of the Rot Front, the United Communist Party, the Workers Revolutionary Communist Party, and Communists of Russia. Even truckers from the Association of Russian Carriers (OPR) came to condemn the ROC’s increasing appetite for property. Members of the Communist Party of the Russian Federation, which holds seats in the municipal, regional and national parliaments, ignored the event, for which they were roundly condemned by their non-systemic counterparts on the podium. Unlike liberal opponents of plans to transfer ownership of St. Isaac’s Cathedral Museum to the ROC, the protesters made no attempt to be diplomatic and did not mince their words. Some speakers declared the ROC “satanic” and compared it to Islamic State, an organization that has been banned in Russia. For ten minutes, Ivan Lokh, leader of the Witnesses of Foucault’s Pendulum, an atheist community, fiercely and emotionally denounced the ROC’s desire to exterminate science and culture. He then quoted Chernyshevsky, whose monument was the focal point of the entire rally. “Religion’s purpose is to inure the unfortunate and hungry to the notion they must perpetually be hungry and rejoice in their plight. That’s what religion is!” proclaimed the activist. ROC leaders are themselves not inclined to the asceticism they popularize among the oppressed classes, and this can only indicate that the highest ranks of ROC clergymen do not believe in God, said Lokh. “We see the indecent luxury in which ROC hierarchs live. They do not fear their own God. They don’t fear Him, because they know for certain He doesn’t exist. This is the most obvious proof He really doesn’t exist!” the activist shouted to the applause of the crowd. During breaks between speakers, the rally’s organizers asked protesters to carefully observe those in attendance in order to weed out provocateurs. The event’s moderator explained to ZakS.Ru that anti-clerical rallies have frequently been visited by people wanting to disrupt them. In addition, MP Vitaly Milonov’s public promise to interfere with the picket had forced protesters to be vigilant. Semyon Borzenko, a member of the city committee of the unregistered United Communist Party’s regional branch, thrilled the crowd when he called for abolishing the federal law on transferring property to the ROC, which has led to the destruction of numerous museums. Borzenko also said atheists should campaign for the adoption of two law bills, drafted by local municipal deputy Irina Komolova during the previous sitting of the St. Petersburg Legislative Assembly. The first would protect the feelings of atheists, while the second would strip the ROC of its “totally unjustified tax breaks.” According to Borzenko, the “indecent luxury” mentioned by Ivan Lokh was a consequence of the fact the ROC did not pay taxes, unlike every other organization. Nikolai Perov, leader of the regional branch of the Communists of Russia, focused his criticism on the “Zyuganovites,” who had welcomed the possible transfer of St. Isaac’s Cathedral to the ROC. “It’s a crying shame that certain members of the communist movement, who sit in parliament, have retreated from the [Bolshevik] decree and Leninist principles. Shame on Zyuganov! Shame on [CPRF Petersburg Legislative Assembly member] Alexander Rassudov! Shame on [State Duma member and filmmaker] Vladimir Bortko! There’s not a single scientifically minded person left in the CPRF!” stated Perov. Despite the concerns of organizers, the rally came off without any provocations or crackdowns on the part of law enforcement. Towards the end of the rally, human rights activist Dinar Idrisov (recently denounced by “soldier of Christ” and city parliament speaker Vyacheslav Makarov for insulting the feelings of believers) handed out pamphlets entitled “The Museum Belongs to the City.” Like a week ago, opponents of transferring St. Isaac’s to the ROC had their pictures taken, placards in hand, this time standing next to the monument to Nikolai Chernyshevsky.